On Nov. 4th Red Deerians came out to celebrate the one year anniversary of A+ Art Gallery & Unique Collections. 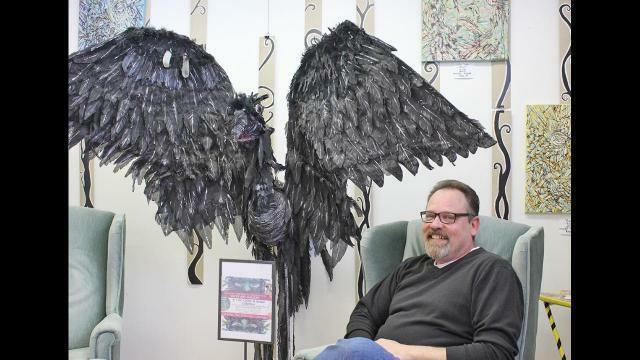 “There’s a lot of wonderful talent here showcasing the best of Red Deer and Central Alberta,” said Michael Huyzer, one of the artists and owner of the gallery. The day was also a heartfelt day for Huyzer, as he looked back to the inspiration of how the gallery came to be, his mother. “My mom had passed away last year of pancreatic cancer. We sat together and discussed a lot of our hopes and dreams. She said, ‘It’s time to shine, it’s time to bring art to everyone and enjoy it,’ and she was very much a part of the gallery. She was the concept,” said Huyzer. He added when he looks at what his mother had set out for him, it’s grown so much. He said he’s thankful for not only her, but his partner, his family members, customers and the artists. The name of the gallery, A+ is named after his mother, Antonia, which came from when he and his mom were sitting in her room, thinking of ideas for names of galleries. “I have a picture of her in the gallery as well with her angel that she had. I put that as a centre piece in the gallery because it’s a loving memory, and I look at it very fondly every day being thankful,” he said. Currently, the gallery has 17 artists who are showcased, with more to come. Huyzer said he too has displayed his work in coffee houses, tents and all sort of different events. He said there is more heart to what the gallery offers. “This is a labour of love, a labour of showing what art can be. It’s also healing,” he said, adding that art helps people through difficult times, and can also be an outlet for people. For Huyzer, art has always been a part of him. “I did things in art always. My mom let me draw on my carpet in my bedroom a whole boarder in permanent black felt marker. My mom let me do crazy things and that was my outlet,” he said. Looking back over the year, he said he’s humbled to have such wonderful people around him, and is thankful to the people of Red Deer. He said A+ is a different gallery than others, and is a different kind of niche in what they are trying to do. “We’re very eclectic and quirky. I have a lot of customers coming in and saying they love the homey aspect of walking in and they can picture the artists work at home,” he said. Huyzer said he’s happy to share the story behind the gallery with customers, but not just his mother’s story. Though his mother isn’t with him anymore, he said she still lives on through the gallery.